(Nanowerk News) An inexpensive, low-tech method for counting white blood cells, that uses gold nanoparticles and paper has been devised by researchers from the A*STAR Institute of Bioengineering and Nanotechnology ("Trapping cells in paper for white blood cell count"). The simple, low-cost and compact nature of this method makes it particularly attractive for point-of-care applications in settings that lack sophisticated medical resources. White blood cell count is a vital indicator of a person’s health. Too many white blood cells may indicate a bacterial infection, tissue damage or inflammatory diseases such as arthritis or allergies, whereas too few could denote a viral infection or bone marrow deficiency. Furthermore, white blood cell count can be used to predict a person’s risk of developing conditions such as diabetes and heart disease. Currently, white blood cell counts are performed at large, central laboratories equipped with large and expensive analysis systems that are operated by experienced medical technicians. But many parts of the world lack such facilitates or expertise. 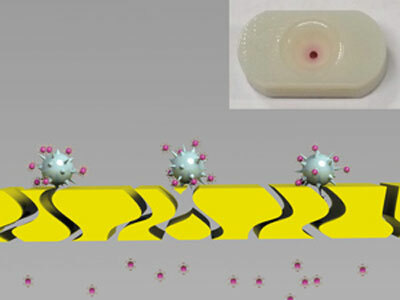 To address this problem, Yi Zhang, Jianhao Bai, Hong Wu and Jackie Y. Ying from the Institute of Bioengineering and Nanotechnology in Singapore have developed a compact, paper-based platform that can be used to count white blood cells. “In rural areas where clinical laboratories are inaccessible, platforms like ours could provide a white blood cell count rapidly and allow timely clinical intervention, thereby improving the clinical outcome,” says Ying, who led the research team. The technique employs gold nanoparticles coated with an antibody that interacts with white blood cells. The antibody causes the nanoparticles to attach themselves to white blood cells in a blood sample, which can be obtained by simply pricking a finger. The blood sample is passively filtered through a small test paper. As white blood cells are too large to pass through the pores in the paper, they become enmeshed in it (see image). A dark spot then forms on the paper surface due to the gold nanoparticles on the white blood cells. By visually observing how dark the spot appears, it is possible to gauge the number of white blood cells in the sample by measuring the intensity of the dark spot.